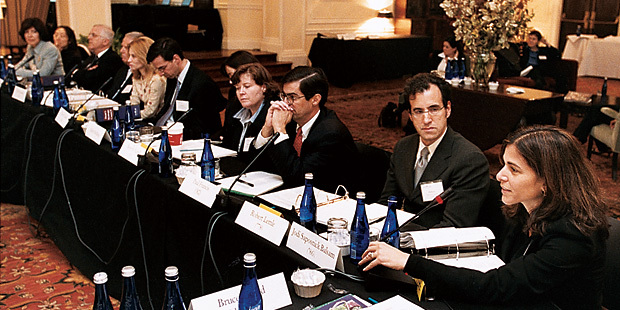 In 1990, a group of alumni convened to strategize about NYU School of Law’s future. Under the leadership of then-Dean John Sexton (currently NYU president) and Law School Trustee Martin Payson (’61), the Council established a blueprint of ideas to guide the institution over the course of the next decade, a strategy that provided the foundation for the Law School’s success as it solidified its reputation as the top global law school. After meeting with alumni across the country during the first year of his deanship, Dean Richard Revesz decided to resurrect that concept and draw from the deep well of resources the alumni community offers. The Council brought together a group of professionals from a cross-section of alumni to strategize about the goals and aspirations of the NYU School of Law. The 78-member Council is chaired by Eileen FitzGerald Sudler (’74), general counsel of the Sudler Companies, a privately held construction and development concern. Sudler started her legal career as a criminal defense attorney for Legal Aid, later serving as assistant U.S. attorney for the Southern District of New York. She then worked in private practice before entering the real estate field with her husband, Peter Sudler (’73), president of the Sudler Companies and a trustee of the Law School. The Council first convened on November 20, 2003, to identify key issues for the next decade. During the daylong session, the Council heard from panels of faculty, students, administrators, and board members. The first panel of the day brought together faculty to discuss the practical application of scholarship. Five scholars—Noah Feldman, associate professor of law; Gerald López, professor of clinical law; Michael H. Schill, then the Wilf Family Professor of Property Law and professor of urban planning, now dean of UCLA’s law school; Stephen Schulhofer, Robert B. McKay Professor of Law; and Linda Silberman, Martin Lipton Professor of Law—discussed the challenges of connecting scholarship to the “real world.” They noted that the purpose of legal scholarship is to improve the ability of the legal system to deliver justice. The faculty also fielded questions about how they fund their scholarship, the involvement of students, and the importance of the colloquia and weekly faculty workshops in identifying and developing research topics. Feldman identified a need for more specialized training of faculty members in how to acquire the funding they need to support their research. The implications of that change for the Law School are one of many issues the Council plans to consider. A representative slice of the student population joined the Council for lunch to share their perspectives on the Law School. The group included: Erin Dow (’06), Filomen M. D’Agostino Scholar; Jeremy C. Marwell (’06), Furman Academic Scholar; Sonja Shield (’04), Sinsheimer Public Service Scholar; and Leila K. Thompson (’05), An- Bryce Scholar. When asked to explain why they chose the NYU School of Law, Shield responded: “It was the only place I visited where students said they actually enjoyed law school.” Others mentioned the strong intellectual community that they sensed during the recruitment and orientation sessions, the accessibility of the faculty, the energy and liveliness of the Law School, and the opportunities that New York City offers.